A recruitment funnel is essentially a pool of possible candidates gathered pre-emptively, as a contingency against possible of vacant positions. It starts from surveying all available candidates, and ends at closing in on the perfect match. There are many points of view on precisely how to execute an efficient recruitment process, but there are a few key components agreed by all industry experts. For example, it is advised against a lengthy and complicated recruitment process. It is also widely agreed that simplified and streamlined application process is the prudent way for recruitment. The primary factor, however, for how efficient a recruitment process is, remains the number of perfect hires made, for there are three kinds of matches to every position: the good, the better, and the best. Hiring being the key for the growth of any organisation, it is absolutely vital that the candidate that that is hired is nothing short of perfect for the job. As far as recruitment funnels go, there are a number of choices readily available, such as the many prominent and trusted job portals. Investment in building external funnel (of all kinds of assets including time) can be kept to a minimum fairly easily. The best place to invest one’s assets would be in increasing the recruitment efficiency through the deployment of tool that is up to the task. This is where AI solutions like Sniper AI . Auto-sourcing resumes from the existing funnel, it helps save a lot of time on this step of the process. Machine learning makes the AI evolve with every use, which in turn directly increases its auto-sourcing efficiency, thus speeding up the entire process manifold. 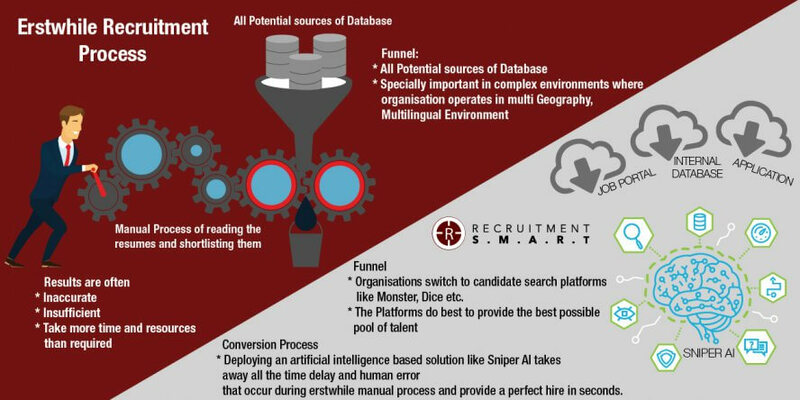 To sum up, the key area to invest in and gain leverage where it counts is the recruitment efficiency, and the way to go about it is with the right tool, like Sniper AI.